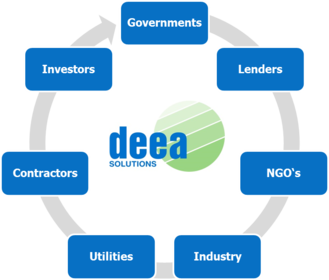 deea solutions GmbH is a Frankfurt based German technology provider and advisory hub. We provide best practice tailor made engineering solutions and business concepts in Renewable Energies and Clean Technologies. The company emerged from the engineering department of Deutsche Eco AG, a former German system integrator in the field of Renewable Energies and Energy Efficiency, founded in 2003. Since more than 15 years we are implementing renewable energy projects. Our comprehensive set of skills and products ranges from 1-st class engineering solutions to technical, economic, and commercial advisory. All based on our long-term experience in Renewable Energies - around the globe - Onshore and Off-shore! We have successfully implemented a series of Clean-tech projects for utilities, development banks, governmental bodies, industrial clients, private investors and NGOs. Kindly refer to a selection of references and contact us for your tailored service package. Our tailored solutions can be devided into technology cluster or client cluster.